Hep C elimination in NSW by 2028 – what’s the treatment landscape looking like? We have a brand new website – please come and visit! In a detailed analysis, Hepatitis NSW CEO Stuart Loveday describes the hep C treatment landscape and argues the really hard work to achieve HCV elimination in NSW by 2028 is only just beginning. The Kirby Institute’s newsletter Monitoring hepatitis C treatment uptake in Australia, December 2017 Issue gives us very good news. In the 16 months from March 2016 to June 2017, 43,360 people were estimated to have commenced Direct Acting Antiviral (DAA) hep C treatments in Australia. That’s 19% of the 227,310 people estimated to be living with chronic hep C in Australia at the end of 2015. Of those 43,360 people treated, 15,470, or 36%, were in NSW. The new all-oral, DAA treatments for people with hep C were listed on the Pharmaceutical Benefits Scheme (PBS) on 1 March 2016. Between 2014 and June 2017, 47,700 people with chronic HCV, or 21%, were estimated to receive DAA treatment through all means, including PBS-listed treatments, clinical trials, special access schemes and through generic DAAs importation. Adding to the good news, it is estimated that 69% of those people living with hep C related cirrhosis in Australia (14,020) and 16% of those without cirrhosis (33,680) initiated treatment up to June 2017. Taking into account the number of people who have been cured of their hep C, as well as allowing for new HCV transmissions, the Kirby Institute estimates that at the end of 2016, there were 199,412 people in Australia living with chronic hep C. For the first time for very many years, we’re below the 200,000-people-living-with-hep C-in-Australia mark. This progress bodes well for achieving HCV elimination. But what does elimination mean, and what must be done to achieve it? Elimination of an infectious disease is not complete eradication. Instead, there are three essential features or targets, as agreed by the World Health Organisation (WHO), that are needed to achieve the definition of ‘elimination’. This has also been described as elimination of hepatitis C ‘as a public health concern”. The NSW Ministry of Health and its Local Health Districts have adopted 2028 as the year in which HCV elimination will be achieved. The Australian Government Health Department is likely to set and the WHO has already set 2030 as the year by which hepatitis C will be eliminated. 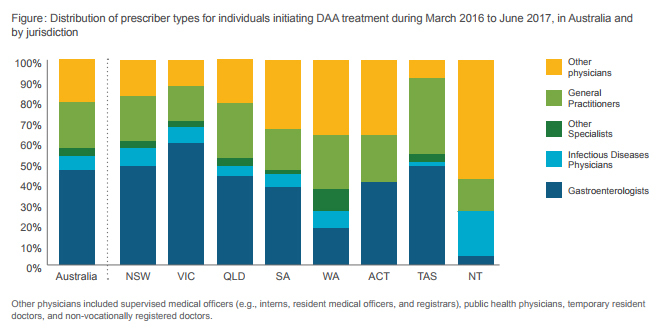 A significant number of people who inject drugs (PWID) who were connected with drug health services accessed DAA treatments in this wave. We suggest that common characteristics of the people who accessed treatment in the FIRST WAVE included: existing connectedness with HCV treatment services; strong health-seeking behaviours; good awareness and knowledge of DAA treatments and relatively high levels of health literacy. From clinical and social perspectives, these people were easy to reach and easy to engage in treatment. Most of these people had not been keen to undergo the previous interferon-based therapies for reasons that are well known. Instead, they were ready and waiting for the new, short-duration, minimal side-effects, easy-to-take and, above all, exceptionally high cure rate DAA therapies to be made available in Australia. There are differing views about the terminology used to describe the remaining people with hep C needing treatment and cure, for elimination to be achieved. In effect there are just two waves: the first wave already passed, and everyone else who requires treatment is in the next “wave”. 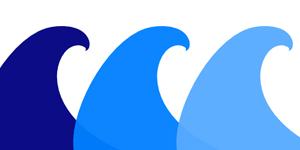 But Hepatitis NSW uses the THREE WAVES description simply to describe, for education, planning and advocacy purposes, the populations of people with hep C requiring treatment and cure and the treatment settings where they have already accessed, are currently accessing and will need to access HCV DAA treatments if hepatitis C is to be eliminated in NSW by 2028. We make clear that these SECOND and THIRD waves are happening simultaneously. Already underway, the SECOND WAVE comprises many people with hep C who are already accessing drug health and related services where there is extra targeted work being done in NSW to inform and mobilise people into DAA treatments: in OST and NSP services, in correctional settings and to a lesser extent in residential rehabs, in homelessness services and in mental health settings. This SECOND WAVE (and of course part of the FIRST WAVE and part of the THIRD WAVE) is where people who inject currently or might inject in the future, often marginalised, benefit from “HCV treatment as transmission prevention” – where, if we reach all or most of those people, ongoing transmission of HCV infection is by-and-large stopped. We suggest that the following characteristics are over-represented among the people in the SECOND WAVE: in some cases poor mental health, alcohol and other drug dependency, regular incarceration, homelessness, lower socio-economic backgrounds and competing social and health priorities. People in the SECOND WAVE can perhaps be characterised as easy to reach but hard to engage into HCV treatment. Peer education will be one key way to engage people to help reach, build capacity and support them into HCV treatment and cure. In NSW, the NGOs NUAA and Hepatitis NSW carry out this essential peer education work. NSW is fortunate in being the only Australian state where its health department, in our case the Ministry of Health, has set HCV treatment targets within the Key Performance Indicators (KPIs) of its Service Agreements with their 15 geographical Local Health Districts and with the Justice Health and Forensic Mental Health Network (JH&FMHN) who deliver hep C treatment in correctional settings across NSW. These government health services are required to meet those targets / KPIs. The THIRD WAVE of hep C DAA treatments is already underway and comprises everyone else with hepatitis C.
This group predominantly includes people who no longer inject, people from countries of high HCV prevalence and from CALD backgrounds, people who have never injected and people who acquired HCV through medical procedures. It also includes the estimated 19% of people with hep C who remain undiagnosed. That’s around 38,000 people with hep C in Australia who don’t know they have it. The THIRD WAVE contains an even larger number of people with hep C than the SECOND WAVE. They are people with hep C who do not attend the drug health or related health services described in the SECOND WAVE. They are more likely to visit their GPs for general health needs. Awareness of the new hep C DAA treatments or of their benefits is low, levels of health literacy are likely to vary greatly and they are unlikely to have high levels of health-seeking behaviour. As in the general population, some people will have poor mental health. And of course, there is limited awareness of the new DAA treatments, and a disbelief that the new treatments can be so radically different from and better than the old Interferon treatments which had such terrible side effects for so many people. People in the THIRD WAVE can be characterised as hard to reach and hard to engage into HCV treatment. “HCV treatment as prevention of advanced liver disease” (including cirrhosis liver cancer) is vital in all waves. General Practitioners and other primary health physicians will play an increasingly important role in prescribing the new DAAs to people in the THIRD WAVE of HCV DAAs treatments rollout, especially as additional new pangenotypic DAA treatments become available. It’s in this THIRD WAVE that the role of GPs and other primary healthcare physicians will be paramount in: diagnosing (via non-judgemental risk-history assessment); testing (HCV RNA pos vs HCV AB pos); liver health assessment (Fibroscan and APRI blood tests); DAA prescription and monitoring and post-treatment SVR testing follow-up. Public liver clinics will continue to manage the hepatitis C-related health needs of people with advanced liver disease, including cirrhosis and liver cancer and for people with complex co-morbidities. It is gratifying to see the investment and approaches taken by the partners addressing the hep C epidemic in NSW. The NSW Ministry of Health, the Local Health Districts and JH&FMHN, GP education providers, NGOs such as Hepatitis NSW and NUAA and NADA and homelessness and mental health services and residential rehabs, people who inject drugs and those people with hep C who contracted hep C from injecting in years past or who have never injected – all work together to inform, raise awareness, educate and mobilise people with hep C into treatment and cure. I argued that the really hard work to achieve HCV elimination is just starting. To get the 80% of people with hep C into treatment and cure, 80% reduction in new HCV transmissions and a 65% reduction in HCV related deaths we need to do much more than we are currently doing. We need more than the excellent awareness campaigns that have begun to roll out in NSW; more than the great GP education underway is achieving, more than the current welcome KPIs across government health services are set to achieve. And new HCV transmissions are still occurring – perhaps some 6,000 to 10,000 across Australia each year, with 90% or more of those among people who inject drugs. Primary transmission prevention efforts are still essential to maintain and expand. We must educate, recruit, enthuse, engage, build capacity, build awareness, reduce discrimination and mobilise. Not just with people living with hep C, but especially with GPs, their networks, and government and non-government health services. We have treated 20% of people with hep C so far. Numbers of people accessing treatment now are stable, but at much lower numbers than we achieved in the FIRST WAVE. We have just ten years to achieve those three elimination targets. 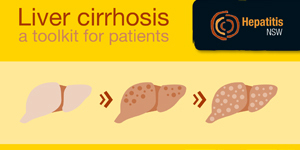 Diagnosis of cirrhosis can be scary, and Hepatitis NSW has published a new booklet that helps clinical staff support their patients. The aim is to help people better understand what is happening so that they can make the best decisions for treatment and health. The idea was suggested to us by liver clinic staff and the booklet was developed with the involvement of various clinicians and, most importantly, by people affected by liver cirrhosis/transplant. Simpler page content that is easier to read. Key information towards the top of each page (where it is needed). Faster page load times (faster speeds). Just one or two key Call To Action buttons on most pages. Creating an account or logging in are no longer required and ordering free supplies of patient information resources is fast and easy.